The Pan-Asia Conference on "Heritage Protection: The Asian Experience” Date: Friday 25th and Saturday 26th January 2019 Place: At The Siam Society Under Royal Patronage, Bangkok, Thailand At a time of rapid economic, technological, and social changes, the Siam Society Under Royal Patronage, a leading Thai civil society organisation in the field of cultural heritage together with the Ministry of Culture and Tourism Authority of Thailand, is hosting a conference entitled "Heritage Protection: The Asian Experience”, held in the English language, in Bangkok, on 25th – 26th January 2019. The conference will bring together Asian thinkers, professionals, and practitioners in the field of cultural heritage protection who will examine the meaning of "Culture”, "Cultural Heritage”, and "Cultural Heritage Protection” in Asian nations. A well-developed corpus of conventions, guidelines, and internationally accepted best practices for cultural heritage protection already exists, which largely arose out of successful European experiences in heritage protection in the 19th and 20th centuries; hence, it is only natural that heritage protection theories reflect such European experiences. This conference invites Asian speakers to describe cultural heritage from an Asian perspective, recognising the diversity of cultures and cultural heritage protection experiences across the Asian continent. 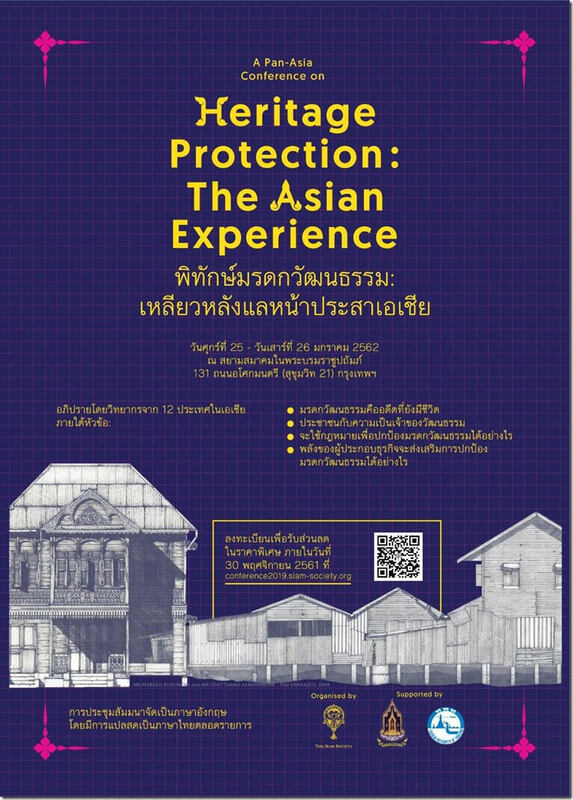 The speakers will look at various aspects of the Asian experience of cultural heritage protection within diverse Asian settings to determine: what are the main obstacles to successful heritage protection; what works and what does not; what lessons can be drawn for Asian people from Asian experiences? Furthermore, they will suggest cultural heritage protection strategies most likely to be effective within the Asian socio-cultural and political contexts, focusing on community involvement, the role of law, and entrepreneurs’ contributions. The conference will be divided into four sub-themes, each addressed in one of the four half-day panel discussions: Heritage is the living present of the past. Early bird ticket can be purchased from now until 30 November! We have special rates for government officials and students! to convey the message that the search for knowledge is the bridge to friendship between people of all nations. Office Hours: Tuesday - Saturday, 9.00 a.m. - 5.00 p.m.